Amazon CloudWatch provides a number of viewable metrics for Amazon SWF workflows and activities. 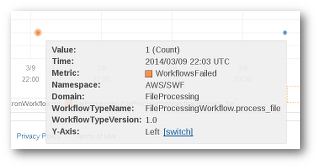 You can view the metrics and set alarms for your Amazon SWF workflow executions using the AWS Management Console. You must be logged in to the console to proceed. 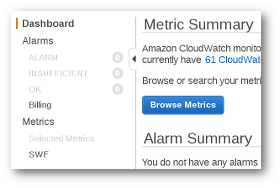 For a description of each of the available metrics, see Amazon SWF Metrics for CloudWatch. In the navigation pane, under Metrics, choose SWF. If you have run any workflow executions recently, you will see two lists of metrics presented: Workflow Type Metrics and Activity Type Metrics. Initially you might only see the Workflow Type Metrics; Activity Type Metrics are presented in the same view, but you may need to scroll down to see them. Up to 50 of the most recent metrics will be shown at a time, divided among workflow and activity metrics. You can use the interactive headings above each column in the list to sort your metrics using any of the provided dimensions. For workflows, the dimensions are Domain, WorkflowTypeName, WorkflowTypeVersion, and Metric Name. For activities, the dimensions are Domain, ActivityTypeName, ActivityTypeVersion, and Metric Name. The various types of metrics are described in Amazon SWF Metrics for CloudWatch. You can view graphs for metrics by choosing the boxes next to the metric row in the list, and change the graph parameters using the Time Range controls to the right of the graph view. For details about any point on the graph, place your cursor over the graph point. A detail of the point's dimensions will be shown. For more information about working with CloudWatch metrics, see Viewing, Graphing, and Publishing Metrics in the Amazon CloudWatch User Guide. 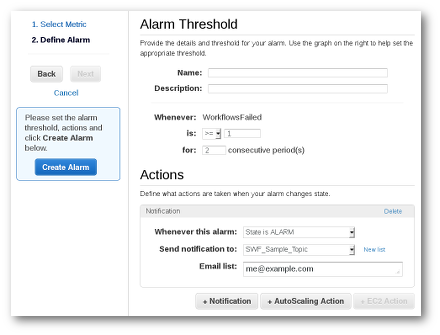 You can use CloudWatch alarms to perform actions such as notifying you when an alarm threshold is reached. For example, you can set an alarm to send a notification to an SNS topic or to send an email when the WorkflowsFailed metric rises above a certain threshold. Choose a single metric by choosing its box. To the right of the graph, in the Tools controls, choose Create Alarm. On the Define Alarm screen, enter the alarm threshold value, period parameters, and actions to take. For more information about setting and using CloudWatch alarms, see Creating Amazon CloudWatch Alarms in the Amazon CloudWatch User Guide.